In case you would prefer longer tour on Socotra Island feel free to contact us and we will prepare the program regarding your requests. We will pick you up at the airport and book you to the hotel (Samar Land Hotel or Socotra Hotel). After check-in drive to Wadi Dingehen to visit the valley and lunch (local Socotrian food) there. Then drive to Delisha Beach (possible snorkeling, diving or swimming) and in the evening driving back to Hadibo. Overnight in Hadibo. After breakfast drive to Dixam and trekking with a tour guide to Haggeher (approximately 5 hours) and lunch. After lunch continuing to Scand (Skand)- protected area. Dinner and overnight in camping area there. After breakfast hike down from Scand to Haggeher mountains (reflect zones of vegetation according to altitude) until we reach the place of „Camel Valley“ and we will take the camels to Farmhen and then trekking and hiking to Deresmoten village (approximately 4 hours). Lunch on the way to village. After arrival to the village relaxing. Dinner and overnight in Deresmoten village. 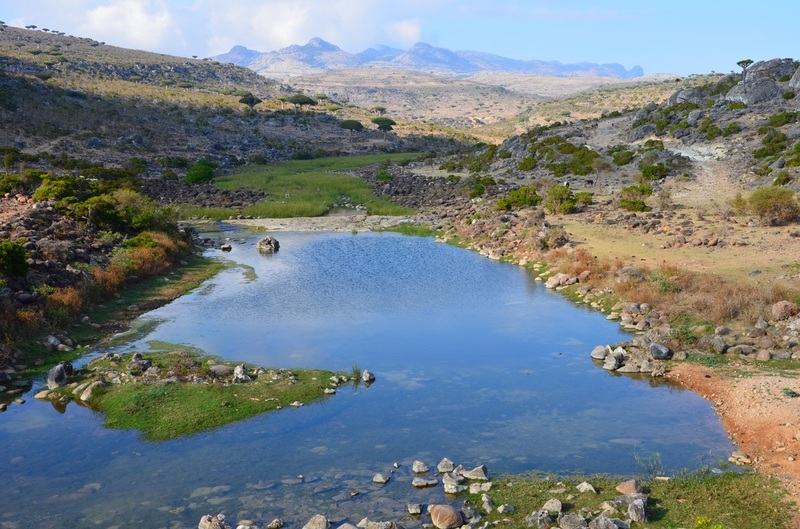 After breakfast trekking from Deresmoten through the valley where you can see Dragon´s Blood Tree (Dracena cinnabari). Lunch on the way. 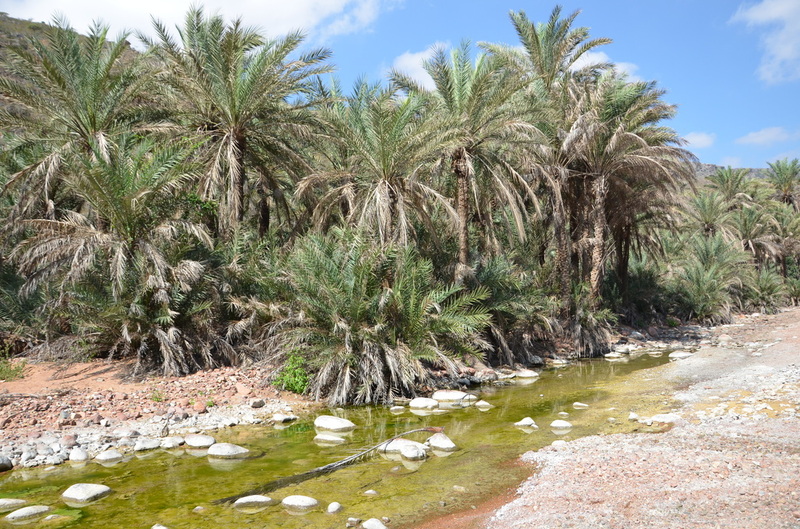 Then drive to Dirhur Canyon (Wadi) where you can swim in the fresh water pool. Canyon is inhabited by birds of all kinds. Regarding some all stories local people believe there are genies in this area. But we can stay in Dirhur Camping overnight with dinner there. After breakfast drive to visit Degub Cave – there are many stalactites, stalagmitees and pools of water that has seeped throught the rock over time. Then trekking to Hayf and Zahek sand dunes – pushed up against mountainside by the seasonal winds of Socotra. If you want you can try to climb and there is a good place for dune skiing. Lunch in Wadi Zahiq. 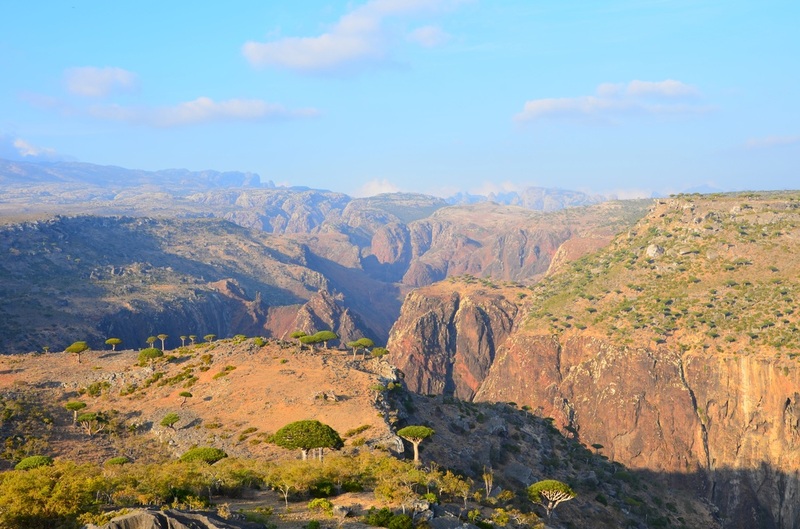 Then drive to Wadi Difarhu – the vegetation here is lush green with many species of birds. In the late afternoon drive to Hadibo and overnight in Hadibo. In the morning drive to Ayhaft Canyon (Nursery of Native Trees) – microclimate is created by numerous springs and streams. 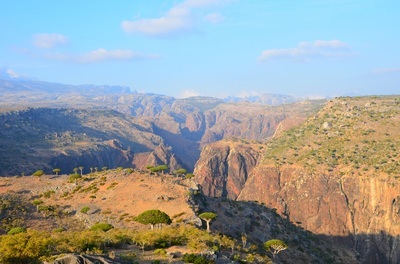 Wadi (Canyon) is protected from Summer monsoons by Skand Mountains. Lunch on the way to visit Hoq Cave. Hiking up to cave (several hours) and explore the cave which was discovered in 2000 by Belgian expedition team. Three-kilometer long limestone cave complex – extraordinary stalactites and natural colums, with history of ritual occupation. In the late afternoon drive to Dihamri Marine Protected Area - located at a particularly gorgeous section of coral reef and one of the best places for diving on the Island. After breakfast we will drive to Qalansyia to look around this charming and picturesque fishing town with its traditional houses and narrow alleyways. Then we will go to the protected area of Ditwah lagoon, which is a protected area and renowned for its spectacular landscape. Sting rays can be seen in the lagoon, so take care when swimming. Overnight there. After an early breakfast, we will drive you to the Socotra airport. You can visit a souvenir shop there while waiting for a flight back to UAE.